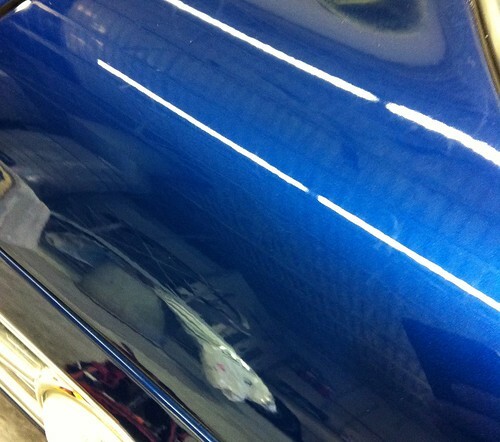 One small piece of trim prevented the completion of repairs to the Porsche last week. New ETA is next Tuesday. 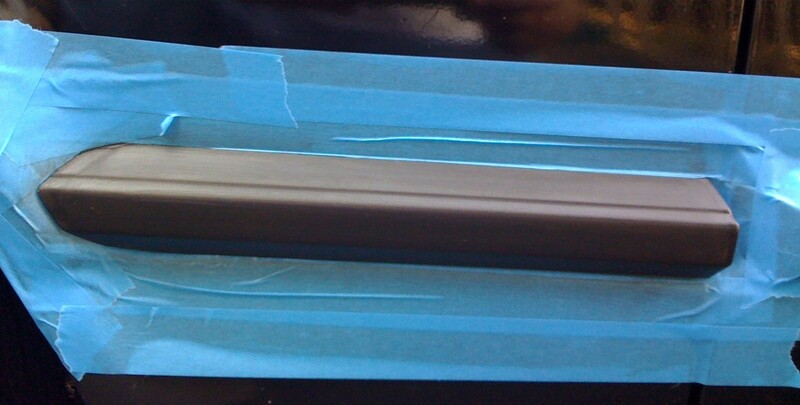 (Can’t attache the trim, can’t put in the window. 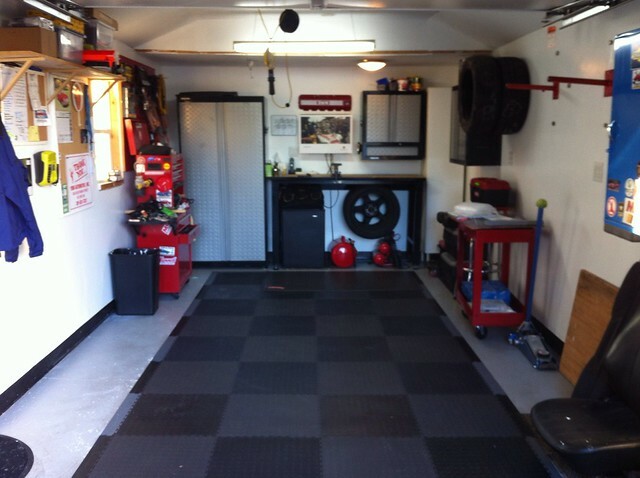 Can’t put in the window, can’t attach the door panel…) Since the garage was empty, we repainted and put down a new floor. So today we went back to the skidpad with some of the instructors from the local BMW club. This would have been more fun with the Porsche, but the MINI is plenty chuck-able. In this video, I’m working on the Scandinavian Flick. In one case, I manage to get the back out more than 90 degrees and still recover. 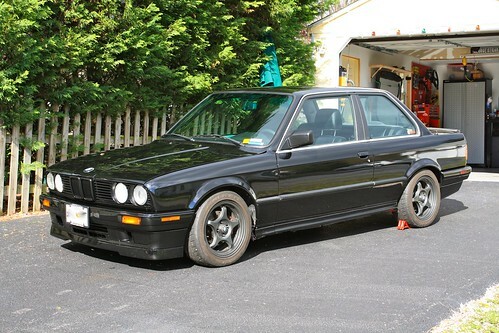 Also listen for the sound of terminal understeer towards the end. I wanted to see how well the camera would pick up that sound. I love it when a product actually works as advertised. The product in this case is produced by Dr. Color Chip. 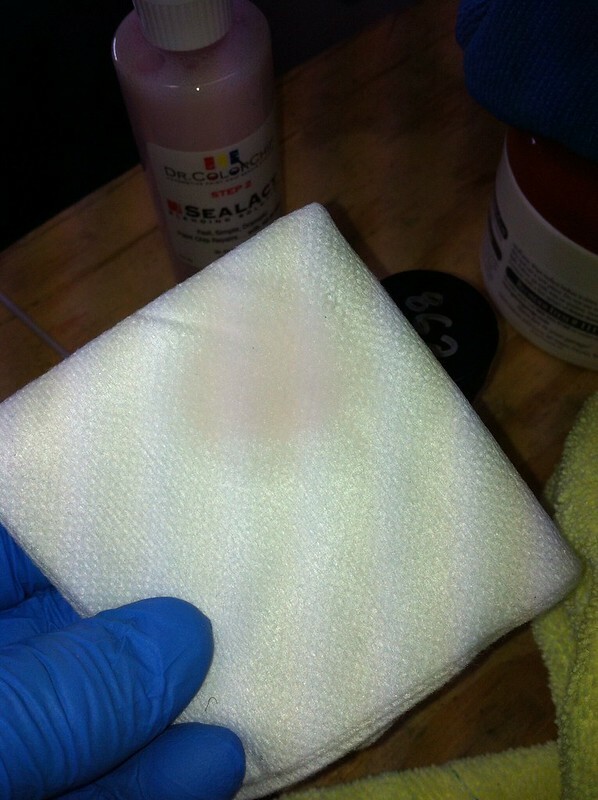 The good doctor produces an automotive touch-up paint kit that really works. 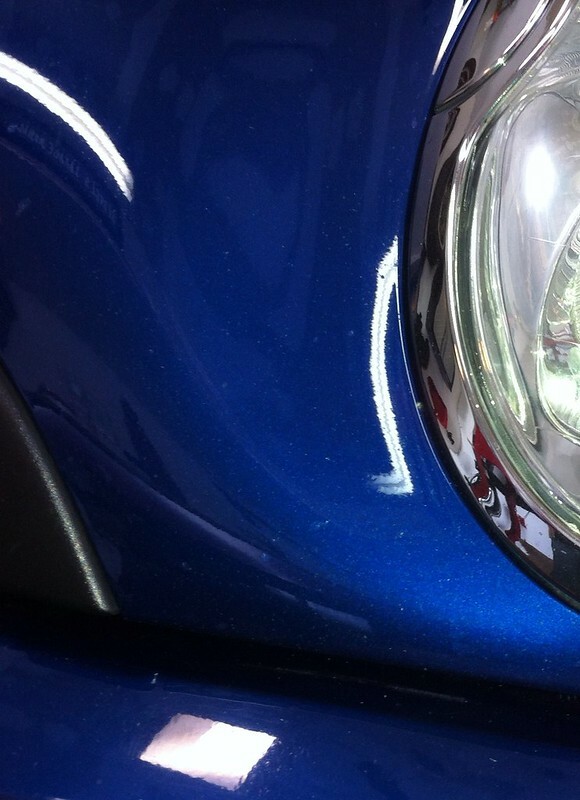 Here’s how: Let’s say you have a car with a very blunt nose, like a MINI. 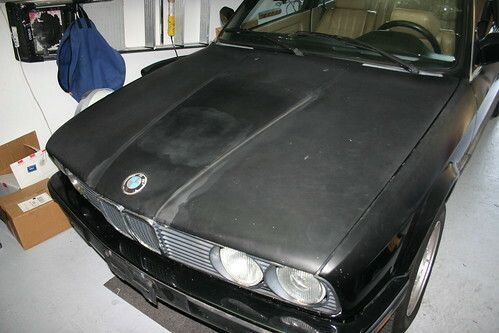 After a number of years, the entire leading edge of the hood can get really chipped as you see in the photo above. 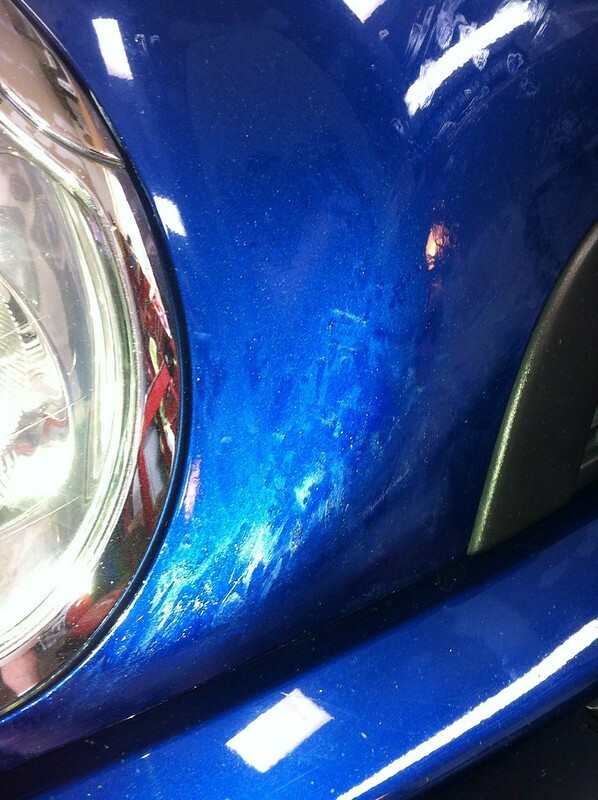 If you use regular touch-up paint, you end up with little blotches of paint where there once were chips. Almost and anti-chip and just as ugly. With Dr. Color Chip, you dab paint on the chip, smear with a gloved finger and once dry to the touch, you buff with the secret sauce. The key is the blending agent. 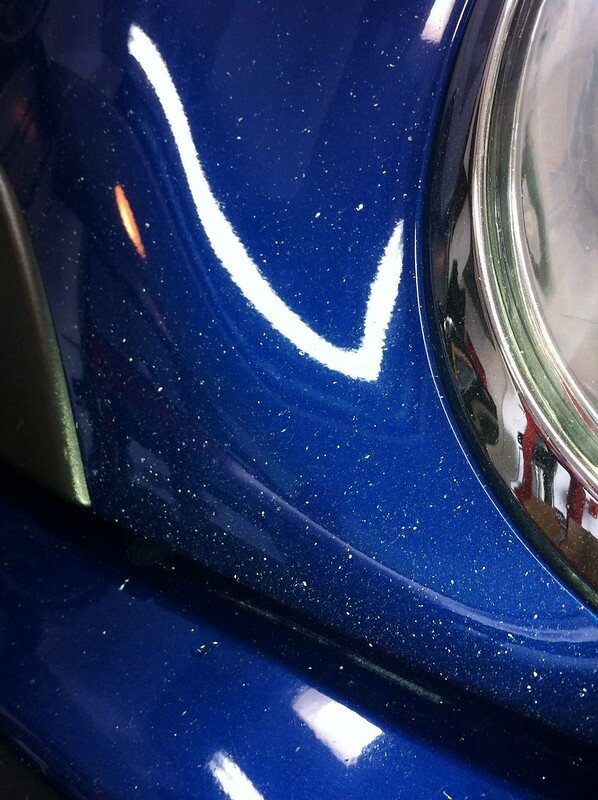 It removes the excess paint, but leaves enough to cover the chip. Polish with a microfiber towel and the results are amazing. You aren’t going to win a concourse with this, but from five feet away, it looks much better than the traditional blotch approach. In fact, most of the blotches you see in the photo above were from using the previous method. I’m a convert. GeorgeCo has been taking a couple of days off ahead of the Easter Holiday here in the U.S., using the free time to catch up on some garage and basement cleaning (more room for spare parts and tires) as well as taking care of a few odds and ends that GeorgeCo can’t get done when working 9 to 5 — things like paintless dent removal and window tinting. 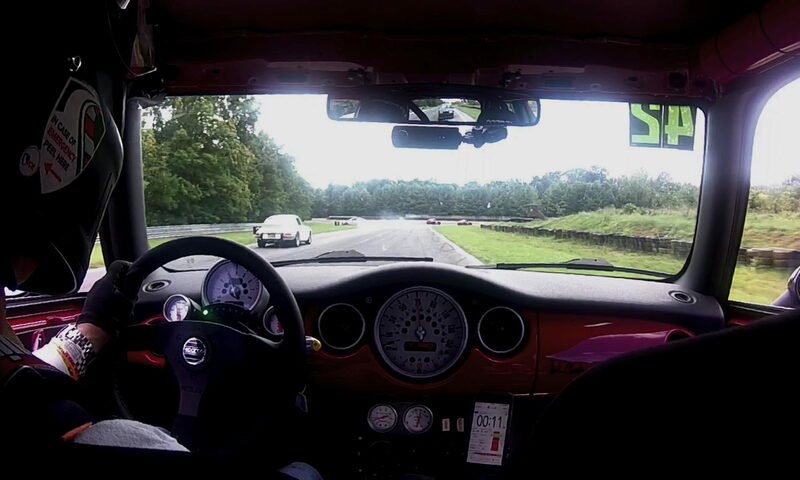 The GeorgeCo MINI powered by Beano has done pretty well in the door ding department. After 7 and one-half years of motoring and 140,000 plus miles — only 3 dings of any significance to date. One of which was from a shelf full of GeorgeCo spare parts that fell on the car while safely parked in the GeorgeCo Garagemahal. The other two were likely earned while parked in the underground parking garage at the undisclosed GeorgeCo work-site location near the nation’s capital. So we made an appointment with the Maryland Dent Masters location in Rockville. Cyress did a great job. 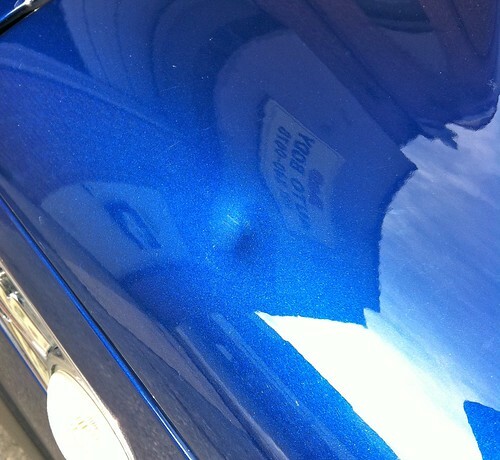 No grinding, painting, or putty and the dents were history before you knew it. The three dings took about an hour to erase and you can’t even tell they were there when he was done. Highly recommended. 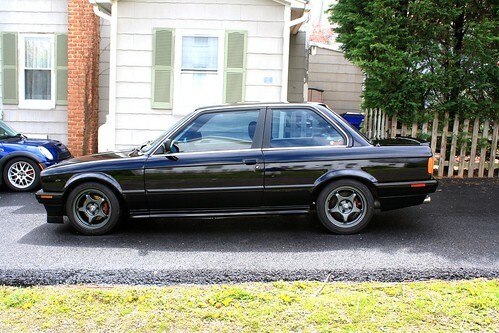 We also got the GeorgeCo E30 back from the tint shop as well. Since it no longer has AC, we need all the protection we can get from the sun. Decided to go with the max tint allowed by the Great State of Maryland (50%). We got the GeorgeCo Stealth E30 back from the paint shop yesterday but didn’t really get to take a good look at it because we were dodging thunderstorms and tornado warnings. Today we rolled it out into the sunlight and to paraphrase Fernando Lamas “it looks mahvelous.” The paint still needs some time to cure, but so far, we’re really happy with it. And the price was right too. Click either the photo above or below for the complete slideshow. Can’t really call it the Stealth anymore. 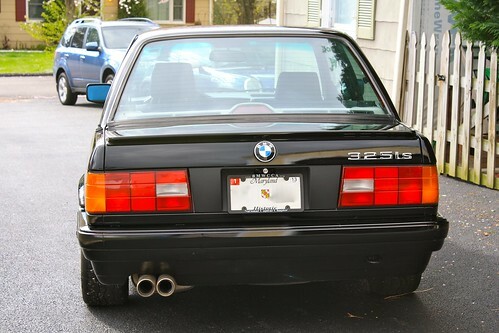 If you have an ’80’s BMW, chances are you have some funky looking door trim. 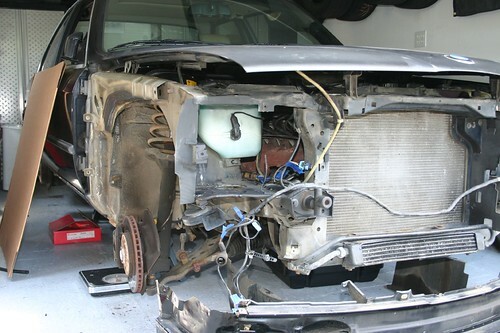 If you’re turned off by the price of OEM replacement parts, take heart: there is a better way. OK, not better, but certainly cheaper. And you can get it at your local Ace Hardware. Acetone. 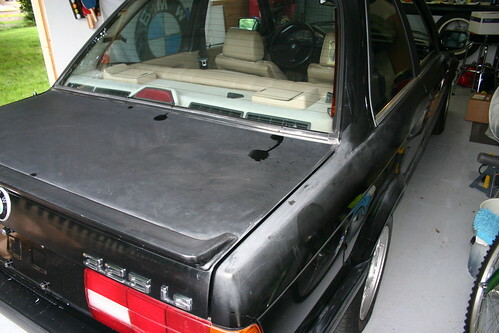 Tape off your trim so you don’t dissolve your rattle-can paint job, put on some gloves to keep your skin attached to your hands, and grab a decent rag and wipe away years of oxidation and discoloration. It’s like magic and only slightly toxic. 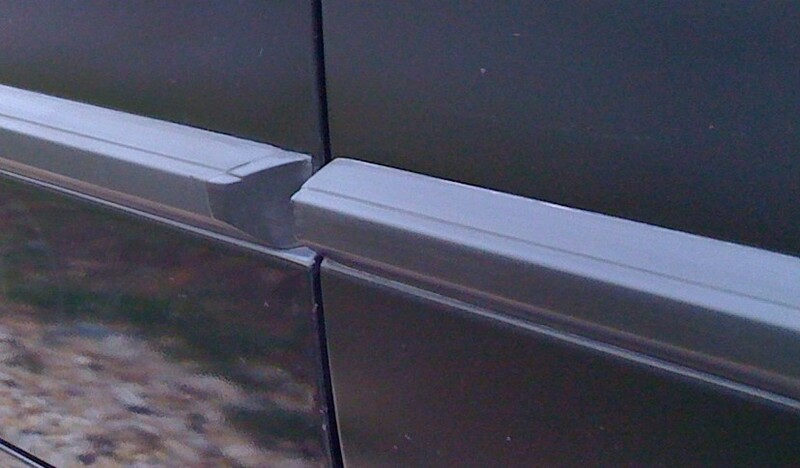 The change is dramatic and immediate, but it only works on the door trim, not the bumper trim.